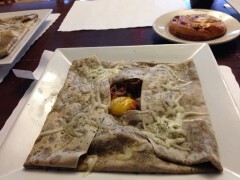 I was able to sleep in a bit, but had a date with Nancy I. and Nancy H. to go to a French bakery before going to the chiropractor. 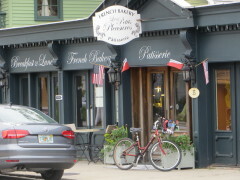 French bakery close to our hotel. 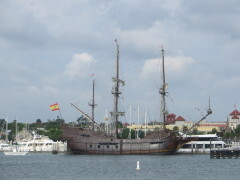 On the way back from the chiropractor (good adjustment), I took a photo of this galleon docked next to the Lions Bridge. 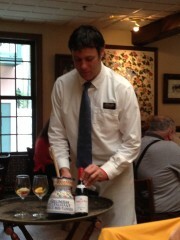 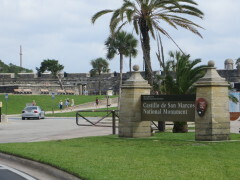 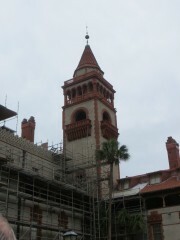 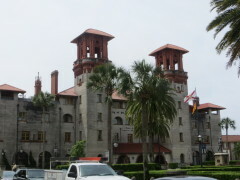 I had visited the Castillo on an earlier visit to St. Augustine. 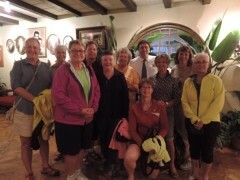 Denise gave us lessons on bike cleaning. 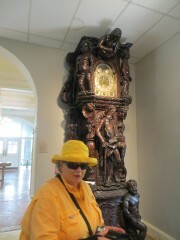 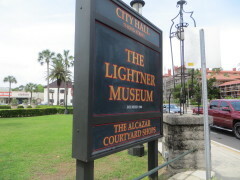 Errands done, Nancy, Nancy and I headed along St. George Street to the Lightner Museum. 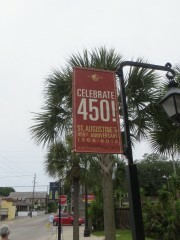 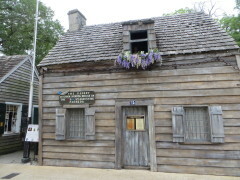 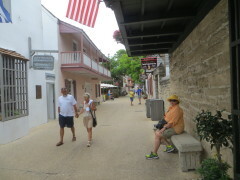 St. Augustine is celebrating 450 years since its founding. 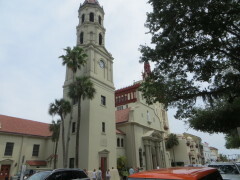 Nancy H. along St. George St.
Cathedral Basilica of St. Augustine. 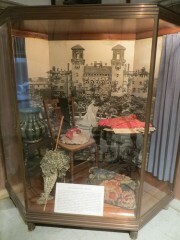 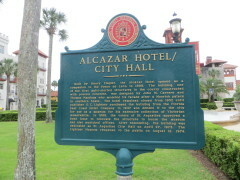 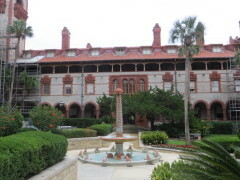 The Lightner Museum is housed in the Alcazar Hotel, built by Henry Flagler. 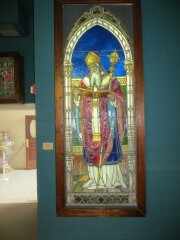 Tiffany glass of St. Augustine. 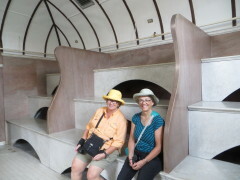 Nancy and Nancy in the Turkish bath of the Alcazar. 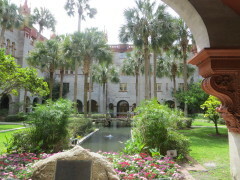 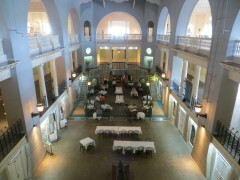 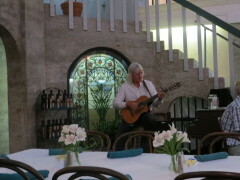 We had lunch in the deep end of the indoor pool at the Cafe Alcazar. 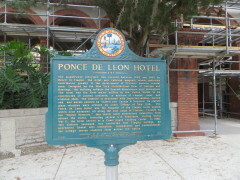 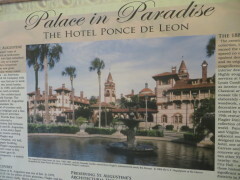 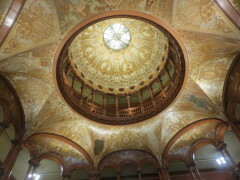 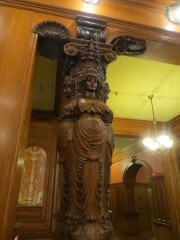 Susan G. found us as we were finishing lunch and she and I went across the street to Flagler College, in the Hotel Ponce de Leon, also built by Henry Flagler. 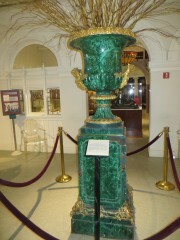 Fountain has 12 frogs (months) and 4 turtles (seasons). 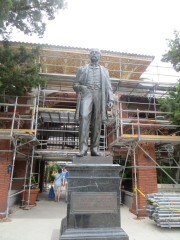 Renovations going on for 450th city anniversary. 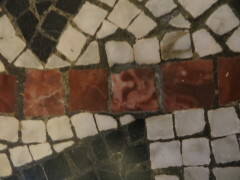 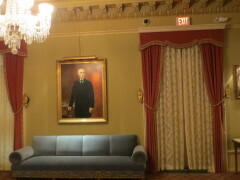 Supposedly Flagler’s face (ghost), found after his funeral. 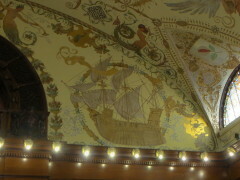 Painted by a single artist. 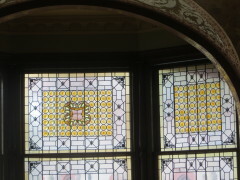 Tiffany windows in dining room. 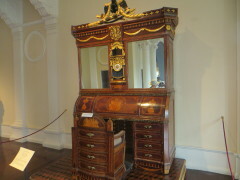 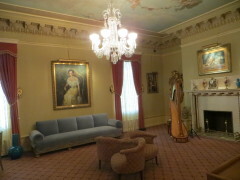 Ladies’ parlor; portrait of Mary Flagler, third wife. 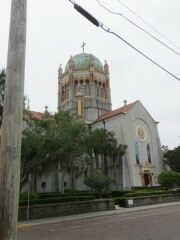 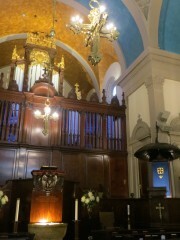 On the way back to the hotel for a nap, we stopped at Memorial Presbyterian Church, where Flagler is buried. 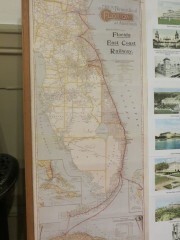 Map of Florida East Railway, developed by Flagler. 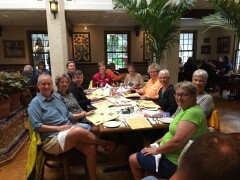 Ten of us had dinner at Columbia Restaurant. 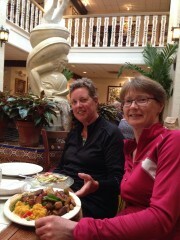 Sharing dinner with Susan G.
Busy, restful day. 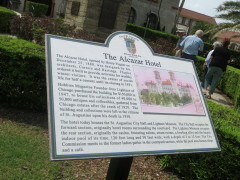 And tomorrow we do NOT go into Georgia, typo on the original schedule.